No matter the number of times I post personal and public comments in an online humanities class for students to create thesis statements and not to use statements of methodology, invariably most continue to use statements of methodology. Frankly, I don’t understand where this habit began and in what disciplines, other than in papers of scientific inquiry, it is encouraged. Obviously, students do not read my comments on previous papers. Verified by activity logs, they do not refer to information I’ve posted online regarding thesis statements. Based on the fact that we are all creatures of habit, they habitually resort to what they think has worked before. Last but not least, they lack skills of transference. But really, most don’t think writing a paper is important, much less writing a paper on a subject in the humanities. Apparently even the testing agency SAT is making essay writing optional. Using Track Changes in a student’s paper, I often highlight the statement of methodology and replace it with a thesis statement, that is if I can determine what is the student’s thesis statement. In addition, I send them personal notes in the assignment comment section. But continue with statements of methodology most do. I’ve thought about bribing them, but I would be broke. In a face-to-face (F2F) technical writing course while we are going through the process of writing a feasibility study, I asked the teams that if I paid them $10,000 for an error-free document, could they eliminate all errors in correctness (grammar, mechanics, etc.) as well as eliminate factual errors. Most said they would try. My facial emphasis plus accompanying gestures punched home the point, well most of the time. But in feasibility studies, we need statements of methodology. I have found a couple of sites that help students create thesis statements. The downsides are that students do need to read the information, proceed through the steps, and recognize garbage, as in garbage in, garbage out. Even though a murderer never gets to kill again, that it is barbaric because it’s often puts to death innocent people and it doesn’t deter. Notice that this model makes a concession by addressing an argument from the opposing viewpoint first, and then uses the phrase “even though” and states the writer’s opinion/main idea as a rebuttal. Here, the use of “because” reveals the reasons behind the writer’s opinion/main idea. The death penalty is a barbaric form of punishment because It does not deter, It is racially biased, and Innocent people die. This model both makes a concession to opposing viewpoint and states the reasons/arguments for the writer’s main idea. While A murderer can never kill again, The death penalty is a barbaric form of punishment because It does not deter, It is racially biased, and Innocent people die. In an online course, how many times should a student be warned before a paper fails? Should I give up and hope that their next instructor finally succeeds? Does their inability to even desire to create thesis statements suggest a lack of engagement with evidence? In other words, do they think that readers must draw the conclusions? In other words, do they want to avoid argument? Does a human’s gaze move from left to right when he/she enters? Does one first notice what is straight across from the entrance? Does one notice people first? Sometimes I might begin the exercise by showing the opening scene of a recent popular movie and have the students describe what they saw first, second, third, etc., in as specific detail as possible. Then we talk about logical approaches to descriptions, such as presenting descriptions according to what the eye first sees. We discuss illogical descriptions, such as not describing the hair, then the feet, and then the upper body of a person; but proceeding from one spot to another that is adjacent, from top down, from bottom up, but always beginning wherever the eye first rests and ending logically in a place that provides transition to the next topic under discussion. We might discuss what an illogical description reveals about the narrator/writer. We also discuss specific details that present clues as to a person’s personality. I usually bring up examples from one or two of the essays written by professional writers that we have read and ask for details that suggest personality traits or behavior quirks of the person or persons being described–short precise descriptions that create an immediate image. Sometimes I ask them to describe what I’m wearing. Does one detail say more than all of the others? Which details suggest my personality? I might walk back and forth and ask them to describe my walk. If I put those descriptions on the board as the students state them, then we can talk about organizing them into a paragraph. I challenge them to state precisely the colors I’m wearing. Even though the following assignment can be handled during class time, because I want unique expressions, details, that require close observations, and because usually I have a follow-up exercise after we discuss all students’ descriptions, I send it home with them. 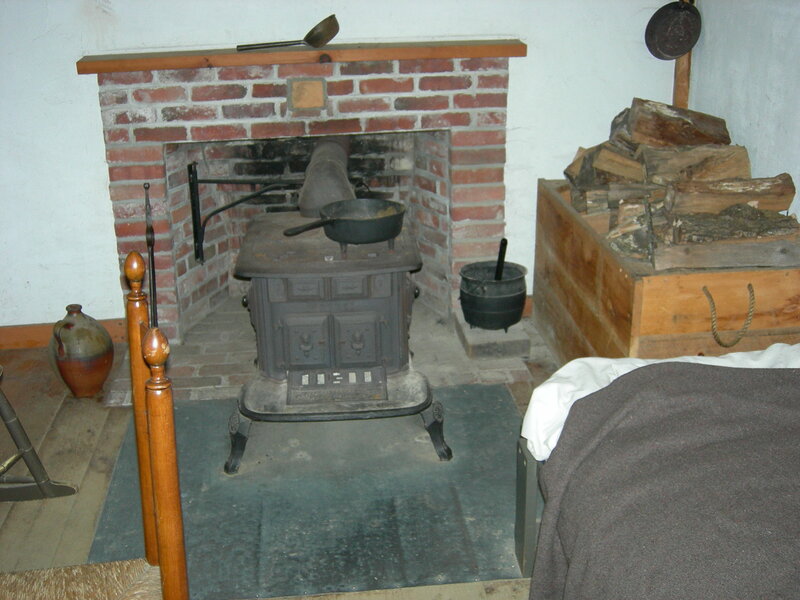 The following picture is one I took on a trip to Massachusetts–the interior of Henry David Thoreau’s cabin on Walden’s Pond. Since most every student has heard of Thoreau from a course or two in high school, At times I have a guessing game as to what famous person lived in that room, which can be quite entertaining, at least to me. Use the space below to describe objectively the following picture. Remember the difference between objective and subjective. Use verbs that describe precisely the action and concrete nouns. Avoid generalizations. Be as specific as possible. Make sure that your description has a logical order. Decide where you are going to begin—what part or what aspect of the picture—and where you will finish. Create ten specific/detailed/concrete descriptions, numbered 1-10, each in a complete sentence that gives a full measure of meaning. This exercise is worth up to 50 points. Points earned depends upon precise detail and complete sentences. I would emphasize using verbs that describe the action and complete sentences, not because students cannot create a description in fragments and not because linking verbs cannot be used, but that all writing students should know the difference between a complete sentence and a fragment and they should practice using action verbs. The next class period before collecting the assignment, ask for some of the descriptions. Comparing the individual statements to the items in the picture can be illuminating to those students who overlooked them. Note: Most all students would not know what an army blanket looks like. Which of the descriptions included colors? Even though we have a picture that only suggests colors and shapes, if we were in that room, what possible sounds would we hear? Logically, what could possibly be in the trunk? You might want to end with this question: What might these details say about Henry David Thoreau? Early in a semester, in a beginning composition class I focus on developing students observation skills and their ability to describe using concrete words, usually in a series of exercises. Since early essays in composition classes often are personal essays and deal in part with memories (narrative and description), one of the research methods I encourage students to use is a trigger object, such as a ring, a memento from a dance, a picture, perhaps a letter. In western North Dakota, a bridle or a saddle was not out of the question. Before beginning the exercises, we read essays written by notable writers and discuss those writers’ descriptions of scenes, of objects, of people, their choices of words, the use of concrete, objective words, figurative language, etc. Finally I give them the assignment. Even if the class is on a Friday, they will have three days to complete the assignment before class meets again Monday. For this assignment, I want you on each day for three days to write about that item: Observe it, think about it, ponder its significance to others (NOT to you); determine what it does, its origin, its looks, etc., everything BUT NOT your emotional feelings about that item. These journal entries (three in all) will be evaluated as to its substantiveness. Each journal entry should be at least 300 words. These journal entries will be worth up to 30 points—10 points each. [You can decide to make this exercise worth as many points or none at all, if you wish.] If you have to, rewrite the journals or compute them so that I can read them. These journal entries will be evaluated as to length, quality of observations and comments, depth of analysis, etc. ; and it should be evident in these journals that you have utilized some of the close observations, techniques, and analysis of at least two of the assigned authors that we studied.